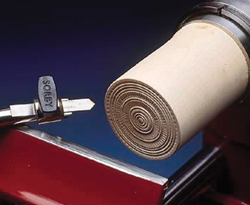 The Sorby Chatter Tool can produce a wide range of decorative patterns on turnings. By varying the cutter length, speed, center height and traverse speed an endless number of patterns can be produced. Each cutters is made of spring steel so it vibrates during use. Two cutters are supplied: one with a pointed end and square end and the other with a domed end and hollow (concave) end. Chattering works best on dense hardwoods especially on the end grain. The overall length of the Chatter Tool is 13" with a tool length of 4".